Over the last few days there’s been quite a hubbub over the location tracking going on in the background on iOS devices, namely the iPhone and iPad 3G. The report that sparked it all focused on a database file stored on iOS devices that stores a record of the rough location of the device over long periods of time — and is unencrypted. Senator Al Franken subsequently sent a letter to Apple CEO Steve Jobs asking for an explanation. Then, last night the Wall Street Journal published an article with a new revelation: Apple and Google (with its Android devices) are both sending some location data from these devices back to their home servers. 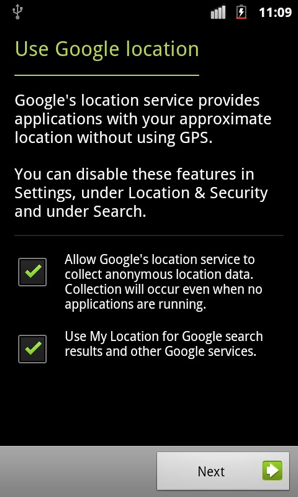 That sounds pretty sinister, but as a long-time Android user it didn’t ring true to me — I vividly remembered a checkbox that asked if I wanted to allow Google to collect anonymized data, which means it isn’t really a secret, and you can opt-out of it. Unsurprisingly, Google confirms that this is indeed the case. Google previously has said that the Wi-Fi data it collects is anonymous and that it deletes the start and end points of every trip that it uses in its traffic maps. However, the data, provided to the Journal exclusively by Mr. Kamkar, contained a unique identifier tied to an individual’s phone. Google explains that when a phone transmits data back to its servers some location data is actually assigned a unique identification number, but it says that this number is in no way associated with the device’s IMEI, the user’s name, or other information. In other words, they’d have a hard time associating a user with that data.